Our Shape Shake won't get in the way of lunchtime. Or force you to give up your beloved snacks. Instead of evil calories and sugar bombs, just sip a Shape Shake with a smile. When you’re craving something sweet. As delicious as a creamy milkshake. But less carbs and fat. More protein and fiber. Perfect after every workout. Or whenever you feel like it. *Our Shape Shake has tons of extra protein. Protein supports muscle development. Our inulin source is a true all-rounder. Chicory is a member of the daisy family and has some of the lowest levels of fat and calories of any vegetable. Many of them are well-known for their healing and aromatic properties. That's why our Shape Shake contains plenty of prebiotic inulin sourced from chicory root. Mix 30 g (approx. 3 tablespoons) of powder with 300 ml water or skimmed milk. Fill the shaker with liquid first, then add the Shape Shake powder and shake well for 20–30 seconds. For best results, have one portion for dinner. Our Shape Shake is simply perfect as a supplement for your dinner, as it is very low in carbohydrates and fats and is a healthy substitute for sweets. No more pesky cravings in the evening! Who should use Shape Shakes? Our Shape Shake stands out with a high-quality organic mix of whey and casein protein. It also contains the amino acid L-carnitine, which can be used in support of a body toning fitness regime. Shape Shake is ideal for anyone interested in controlling their weight with a low-calorie diet. It contains inulin fibre from the chicory root, which promotes healthy digestion. Steviol glycosides, purified extracts of the stevia plant, make the foodspring Shape Shake so delicately sweet. The quality standards with which the components of our Shape Shake are made are particularly strict. The raw materials for whey protein and casein protein in the Shape Shake come exclusively from free range grazing cows. Grazing is as natural as it gets for dairy cows. Out on the pasture, cows have the exercise they need and the fresh pasture grass ensures a high-quality diet, rich in nutrients. As an added bonus, the majority of foodspring products are Made in Germany. That means strict quality requirements for all ingredients. Our Shape Shake - like many other products - is tested regularly by state-certified food technicians. Shape Shake is perfect as a protein shake. The mix of whey protein and casein protein in the basic formula contains very little fat and carbohydrates and is rich in premium quality protein elements. As part of a body toning regime, protein should be your preferred nutrient as it supports healthy body toning. How is it done? Our body splits proteins in a significantly more complex way than it does carbohydrates and fats. Enzymes help to split individual protein elements into amino acid sequences, which can then be transported into the muscle cells. That is why a sufficient supply of essential amino acids (BCAAs) for the muscles must be ensured. They play a central role in maintaining muscle mass during a low-calorie diet. The objective of any successful diet should be the reduction of the body fat percentage (BFP) while at the same time optimising maintenance of existing muscle mass. Body toning efforts can also be supported with the addition of inulin fibre from the chicory root. A diet high in fibre and rich in protein will make it a lot easier to stick with a low-calorie diet needed to reduce body fat (negative overall energy balance) and see the desired training results faster. How can the effects of the Shape Shake be ensured as part of a body toning? Our Shape Shake also contains the amino acid L-carnitine. L-carnitine plays an important role in the transport of dietary fats into our mitochondria, the cellular powerhouses. Here, most dietary fats are utilised as energy carriers and are made available to the body as additional fuel for training. That is the job of the amino acids lysine and methionine, which form L-carnitine and use dietary fats as fuel. The BCAAs contained in our Shape Shake are also direct energy suppliers for your muscles. The human body is unable to produce its own BCAAs. When taken in via food, BCAAs can be metabolised particularly quickly, as they don’t have to be split separately in the gastrointestinal tract. BCAAs are therefore of critical importance for supplying muscles with essential nutrients. The broad spectrum of active agents in high-quality protein and natural fibre can easily be integrated into your daily routine by simply adding a Shape Shake to a healthy diet. Our Shape Shake is perfect for anyone wanting to reduce body fat and looking for a high-quality, effective food supplement. As part of a healthy and well-balanced diet, our Shape Shake is ideal for helping you achieve your body toning objectives and reducing body fat. Be aware: Our Shape Shake contains lactose and is therefore not suitable for vegans or people with a lactose intolerance. Preparing the shake with water can reduce the “actual” lactose content to 1.2 g per shake. Please consult your physician if you are unsure whether or not the Shape Shake is right for you. Our Vegan Protein is a lactose-free alternative. 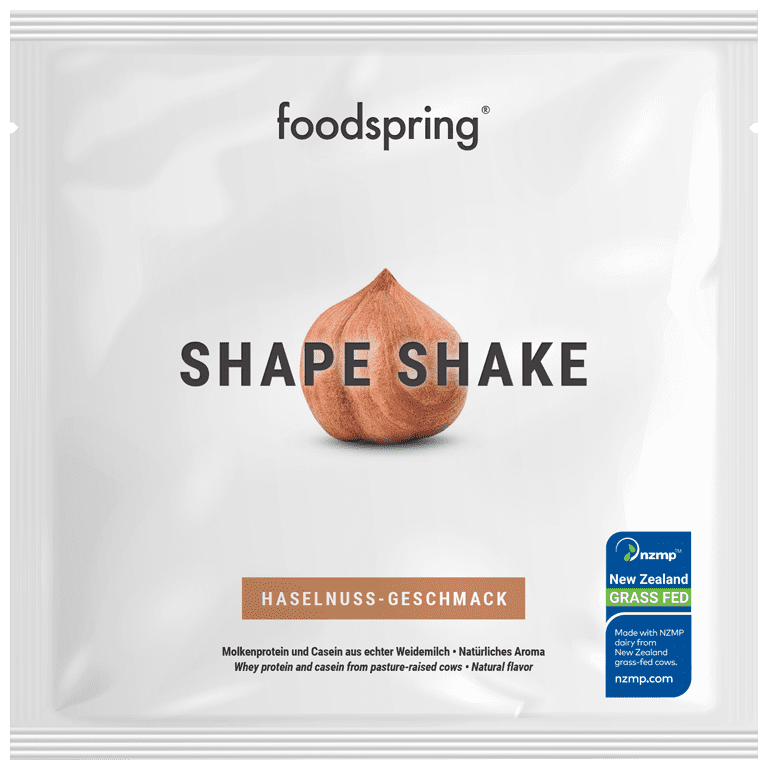 Our Shape Shake is a perfect meal supplement - for example at dinner time - because of the high-quality protein source it contains in combination with inulin fibre. Of course you can also enjoy a Shape Shake for breakfast or lunch. Our recommendation to have one with your dinner stems from the fact that most food cravings occur in the evening. Our Shape Shake will always be a much better choice than sweets and the like: The shake can be had at any time of the day and is not tied to any particular time schedule. This makes the Shape Shake the ideal tip for men and women looking to sculpt their bodies. As with all protein shakes, make sure to drink plenty of fluids if you are using the shake regularly. Two to three litres of water a day is the general recommendation. Our Shape Shake is not suitable for people with a lactose intolerance. In this case, too much of the Shape Shake can result in nausea or stomach pains. When you are buying a shape shake as a supplement to support your body toning efforts, the main thing to look out for is a high-quality protein source. The best post proteins for a shape shake are whey protein or another milk protein with high bioavailability. The milk used in the production of the Shape Shake by foodspring comes from grazing cows and therefore provides a premium source of protein. Another important point is that the shake should contain fibre, which gives you a feeling of fullness. Just as important is the addition of a vitalising amino acid like L-carnitine. It offers optimal support for your body toning efforts as part of a weight-loss regime. The choice of sweetener should also have an influence on your decision. Shakes that are to be used as a supplement for weight loss should not contain any sugar so as to keep the insulin levels constantly low for optimum fat burning. Our Shape Shake ticks all the boxes for a good diet shake and is therefore perfect as part of a low-calorie diet. What makes the Shape Shake different from other formula diets? 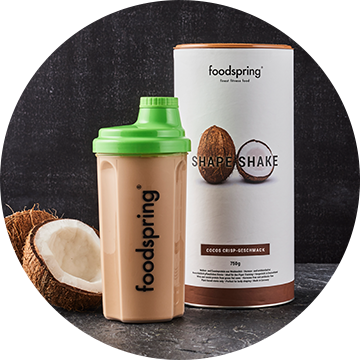 The idea behind the Shape Shake is to supplement one meal per day so that the person feels less hungry overall. We are more than happy to advise you on how to adapt your workout and nutrition as part of a diet. Our objective is always to help our customers achieve long-term, healthy weight loss. How do I best use the shake? Evening often brings those dreaded hunger pangs and sugar cravings. That's why we suggest drinking a Shape Shake as a dinner supplement. Of course, you can also drink a Shape Shake with breakfast or lunch. Does the Shape Shake help you lose weight? Thanks to its low energy balance, the Shape Shake can help reduce the number of calories consumed in a day when used as a meal supplement. Regularly maintaining a calorie deficit is essential for weight loss and burning excess body fat. But we say: Fit is the new skinny! The Shape Shake’s high protein content means it also helps dieters to maintain and build muscles. When combined with a balanced exercise routine and adequate nutrition, the Shape Shake is the ideal supplement for attaining your dream body and staying in shape. Protein is the main ingredient in your shake. That's why we take care to use exceptionally high-quality ingredients. Milk from pasture-raised cows is our standard. That way, we ensure that only the best quality milk gets into your shaker. Milk from grass-fed cows contains more linoleic acid and also has a higher omega-3 fatty acid content than milk from indoor cows. What's wrong with a soy shake? In creating our Shape Shake, we purposely chose not to use soy. Many diet concepts use soy to increase satiety. However, the origins of these soy beans is often unknown. Chicory is healthy and creates a lasting feeling of fullness. That’s why our Shape Shake combines the benefits of chicory root with high-quality protein from grass-fed milk and L-carnitine, which helps you stay in shape on every level. It also means we don't need to use artificial sweeteners. The proteins from grass-fed milk have a higher biological value, and – more importantly – a better taste. The neutral flavoured Shape Shake contains absolutely no sweeteners so that you can drink one whenever you want. Our Shape Shake is gluten-free. May contain traces of gluten due to being produced in an environment with other gluten-containing products. How often can I drink a Shape Shake? No matter what your goals are, a healthy diet and staying active are crucial to achieving your dream body and keeping it. Unlike classic formula diets and diet drinks that simply shoot for fast weight loss, we intentionally take another approach with our Shape Shake. To lose weight in a healthy way, we suggest that you only supplement one meal with the Shape Shake and continue to get the majority of your daily calories through solid foods. Your meals should always be built around complex carbohydrates, essential fatty acids and high-quality proteins, plus fresh fruit and vegetables. Shape Shake taster portion will be back in stock shortly.